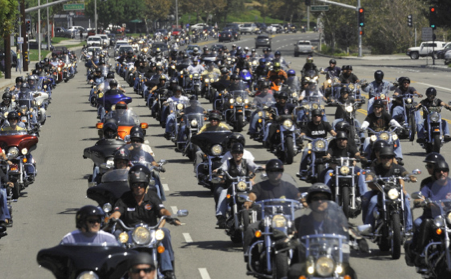 On Sunday, September 11, 2011, thousands of bikers rode together through Orange County, California, in remembrance of that tragic day ten years ago, and in patriotic honor of this country's great loss. Many folks sat on theur porches or along the streets, waiving flags and cheering on the seemingly endless parade of bikers. Though it was mostly Harley riders, there were hundreds of sport bikes and European motorcycles in the parade. The ride began at Cook's Corner, and wound through OC and up to Long Beach. Organized nine years ago by Long Beach Firefighter Gary Biggerstaff, the ride has become an annual Southern California tradition. Two hours after the sea of bikers left Cook's, literally miles of motorcycle riders arrived in Long Beach. 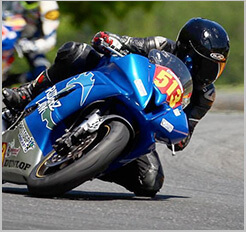 As a lifelong motorcyclist, active motorcycle injury attorney, and frequenter of biker events throughout California and the surrounding states, I've seen and been a part of many motorcycle rides. None has been as inspiring as this one. If you didn't make it out this year, do what you can to join next time.